Brian came through the youth programme at Rangers. Despite being signed professionally with the Club, he failed to break into the first team and after a season on loan at Motherwell, he signed for the Fir Park club. Following three years at Motherwell, he played for Falkirk, and later Preston North End. A year into his two year Preston contract in 2012, he was transfer listed and later signed for United. He was used frequently at centre half under both Peter Houston and new manager Jackie McNamara, however, in July 2013, it was agreed that he would leave the club by mutual consent. He later signed for Ross County. Brian was born on this date in Rutherglen. 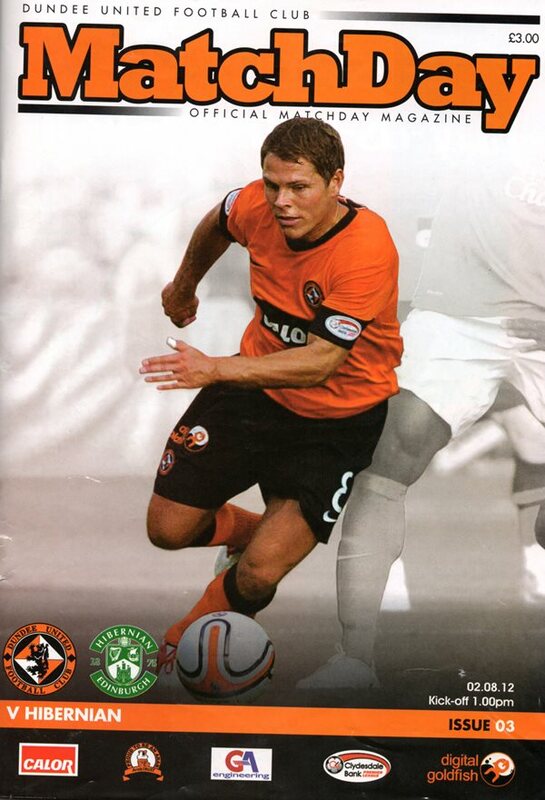 After an absorbing Europa League tie against Dynamo Moscow on Thursday night, it was the start of SPL business for the hosts as they welcomed Hibernian to Tannadice for an early Sunday kick off. Having obviously been impressed with the efforts of his starting side in the previous game Peter Houston made no changes as he sought for a morale boosting win which would ensure the perfect start to the league campaign. The pitch was in immaculate condition and a healthy crowd was in attendance for what appeared to be an attractive game against a Hibs side who always like to have a go. Having not endured the best of league form over the last few years boss pat Fenlon and his squad would be eager to set a different tone early on, and were set up to try and achieve a positive result. United were dealt a major blow for the hotly anticipated Scottish Cup Quarter Final tie against Dundee with Johnny Russell failing a late fitness test. The only change from the draw against Inverness was therefore Stuart Armstrong returning to the starting eleven in his place. This was the first Scottish Cup tie between the sides since 1991 when United defeat Dundee 3-1 at Tannadice at the 5th round stage. The Dens Park side had not won a Scottish Cup tie against United since 1956 – Peter Houston was looking to extend that record and progress to the semi-finals.